Anilox 320/4,8; 315/6; 255/5,7; 225/5,7; 200; 180; 160; 150; 140. Additional information -MATERIALS: LDPE 20-150 microns LLDPE 12-100 microns HDPE 10-150 microns BOPP 12-60 microns PET 12-50 microns OPA 15-50 microns Cast PP 20-70 microns Laminates to 150 microns Max print speed: up to 200 m/min, depending on substrate, motif, ink and the print repeat, etc The thickness of the cliché is 1.14 mm, the thickness of sticky back is 0.55 mm. -POWER SUPPLY: Power supply: 400 V, 50 Hz, 3 phases Possible mains voltage variations of the power supply: ± 10% Drying unit heating source: electric -COMPRESSED AIR: Pressure: 7 bar ± 1 bar Filtration: lower than 5 microns Dew-point temperature: 2°C -UNWINDER &REWINDER Max. diameter of the roll: 600 mm Max. weight of the roll: 250 kg Tension range:Min. 20 N / Max. 205 N -MATERIL FEED SYSTEM A rubberized infeed nip roller which is mounted above the central drum. Nip pressure is adjusted by pneumatic cylinders. - CENTRAL DRUM Temperature Control System Thermostat control system with electronic control automatically maintains the temperature of the central drum on the level of 32°C. -PRINTING UNITS There are 8 printing units designed for front printing which are horizontally fitted around a common central drum, providing a compact design and ease of access. Plate sleeves mandrels: especially designed for use with sleeves. Anilox mandrels: are specially designed for the work with sleeves. Doctor blade chambers: a complete set is mounted on guides. Slow rotation of aniloxes during machine stopovers: assembled anilox sleeves are equipped with a slow rotation system using AC motor while machine stops, which prevents ink from drying in the cells of the anilox sleeve. Ink trays: are made of stainless steel. Guard panels: all cylinders equipped with gear drive. 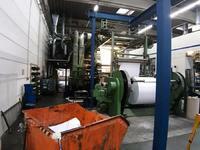 Gear-wheels and dangerous areas of the press meet the European safety requirements for production facilities. -ELECTRICAL INSTALLATION a) The package includes the following items: b) A programmable logic controller (PLC); c) Electrical and electronic components; d) Air-conditioned electrical cabinet-container; e) Electric speed and run length sensors. -SIGNAL AND DIAGNOSTIC During the operation the monitoring of all major components of the printing machine is carried out and it also shows the cause and location of the signal. 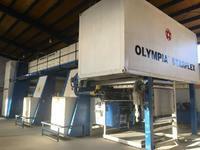 -DRYING SYSTEM >Tunnel drying: It connects the printing units, the winding and unwinding modules. Drying is equipped with statically and dynamically balanced guide rollers mounted on the ball bearings.Dual circuit high efficiency drying system with hot air and high speed made up of: > Inter-colour dryers, including the following: n° 7 drying boxes equipped with nozzles. The boxes can be removed through the side of the machine, the frame includes an inspection door that makes the maintenance simple and convenient. >The main drying tunnel includes: - one high speed blowing fan; - one high-speed exhaust fan; - drying tunnel is 3 m long, equipped with material supply system; - 13 drying boxes, each of which is equipped with its own nozzle (drying boxes can easily be removed for cleaning without tools). 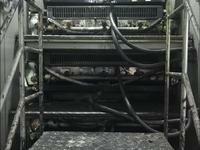 Recirculation of air in the inter-color dryer and in the drying tunnel is in manually controlled. >l. Revolving swinging door is mounted on the printing unit on at the sleeves installation side. 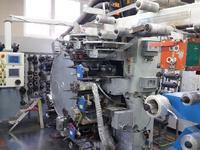 -MACHINE EQUIPPED WITH: - 8 ink pumps. - 8 doctor blade chambers. -EXTRA AVAILABLE: -plate sleeves repeats: 250 - 8pcs, 260-8pcs, 265 -8pcs, 270-8pcs, 275- 8pcs, 280-8pcs, 285-8pcs, 290-8pcs, 295-8pcs, 300-8pcs, 30-8pcs, 310-8pcs, 315-8pcs, 30-8pcs, 325-8pcs, 330-8pcs, 335-8pcs, 340-8pcs, 350-8pcs, 360-8pcs, 360-8pcs, 370-8pcs, 380-8pcs, 390-8pcs, 400-8pcs, 410-8pcs, 420-8pcs, 430-8pcs, 440-8pcs, 450-8pcs, 460-8pcs, -anilox sleeves: 320/4,8; 315/6; 255/5,7; 225/5,7; 200; 180; 160; 150; 140.